Request Instant Information By Clicking Here. OrCall Me Direct at: 410-250-1919 or Toll Free: 1-888-7-BEACH8. Imad Elali is a Resort Sales Specialist serving Maryland's lower Eastern Shore (Ocean City, Ocean Pines, Salisbury and the surrounding areas). Since January of 1996. Imad specializes in the resale of Ocean & Waterfront Properties. Imad Elali has been educated in the finest European tradition. He holds the coveted CRS (Certified Residential Specialist) and GRI (Graduate Of The Real Estate Institute) as well as four other professional designations (LTG, RRS, CSP & PMN) and he is fluent in several languages. In addition to his College background Imad is an active participant at the Maryland & the National REALTOR’s yearly Conferences. He is a graduate of The Floyd Wickman Course and Master Sales Academy. He has been recognized as above average and consistent producer, achieved the Long & Foster Gold Team Chairman's Club level and won The Long & Foster Outstanding Service Award several times. Imad Elali is active in several professional organizations such as The Residential Council of Real Estate, The Women’s Council of REALTOR’s where he serves as The Maryland state President Elect, Master Sales Society and serves as a Director Of The Coastal Association Of REALTORS and is The Chairperson of its board's Educational Committee. Imad Elali is an active member of the Long & Foster’s Gold Team, the local Chambers of Commerce where is currently serving on the board of directors. 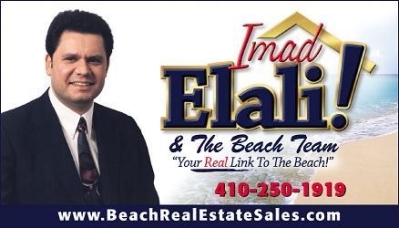 Imad Elali lives in the beautiful Oceanfront resort town of Ocean City, Maryland since the Summer of 1989 where he lists and sells real estate on a full time year round basis. Imad Elali is a dedicated, experienced, energetic and committed to always provide his clients and customers with THE BEST service. Long And Foster is the Nation’s most successful independent company with over 200 sales offices and growing... Long and Foster lists and sells far mores real estate than any other company in the 7 State Mid-Atlantic region. Put Imad Elali’s educational background, experience and enthusiasm for the real estate profession combined with Long and Foster resources to work for you now! Call Imad Elali today! Also your referrals will always be honored and appreciated! "We Get By Giving!" Call Direct: 410-250-1919 or Toll Free: 1-888-7-BEACH8. Please Always Remember To Ask for Imad Elali !. Internet: www.BeachRealEstateSales.comE-Mail: Imad@BeachRealEstateSales.comRequest Instant Information By ClickingHere. ""We must commend Imad for his professionalism, kindness & his willingness to listen & focus on his clients needs. We quickly realized that we not only liked him but also trusted him. We highly recommend Imad Elali & Long & Foster to our many friends who have also shown interest in purchasing in the Ocean City area. Hats off to you Imad. You are the best! You really did a great job."" ""Mr. Elali was excellent through out the entire purchasing process. He was extremely courteous, dependable and efficient. He always made sure to return our phone call and answer our questions."" ""Imad is an excellent realtor, he is most knowledgeable, nice busy agent. He sold three condos for us this year. We couldn't have asked for better. Thanks Imad!!"